The Janam XG100 has been discontinued. No direct replacement is available. The Janam XG100 offers mobile workers an unmatched combination of highly functional design and optimized human interface. Its rugged industrial-grade construction enables full functionality in the most hostile operating environments, while its sleek upper body creates a wide profile for larger keys without adding unnecessary weight or bulk. The powerful battery of the XG100 is located within the unit's pistol grip, lowering the product's center of gravity and reducing its perceived heft. The Janam XG100 also features large, well-spaced keys that are easy to locate and easy to press, a robust 802.11 b/g Summit WLAN radio with Cisco's CCX support, and a powerful Adaptus imager that reads virtually all 1D and 2D barcodes. 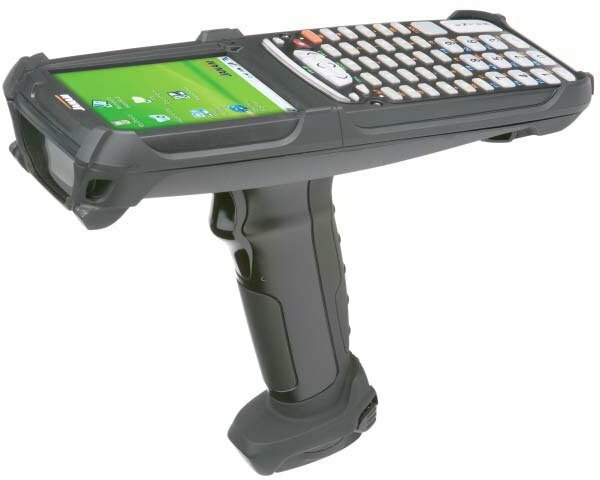 XG 100, 52 key alphanumeric keypad, Microsoft Windows CE 6.0, Marvell XScale PXA320 624 MHz CPU, 256MB/256MB, WLAN 802.11b/g, Bluetooth 2.0, 1D scanning with laser dot aimer, 2D scanning capability, 240x320 QVGA color display, 2500 mAh battery. Requires charging/communications cradle. See accessories. XG100, Rugged Gun-Handle, 802.11b/G, Bluetooth, 1D scanner, Windows CE 6.0, 52 key alphanumeric keypad.